These blazes reduced buildings, cultural heritage, and lives to ashes. Moscow is no stranger to huge fires – several have ravaged the city throughout its history, killing scores of people in the process. In 1547, when flames engulfed the capital, more than 4,000 Muscovites perished. 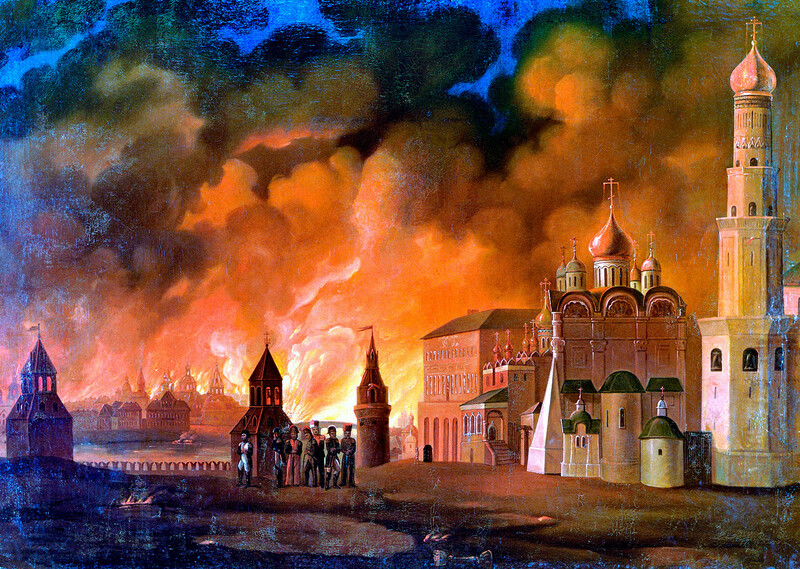 During the French occupation in 1812, Moscow faced one of its most devastating fires. It’s not known who or what sparked the blaze, but the main suspects are vengeful locals or the Russian authorities. The fire destroyed two-thirds of the city including the majority of wooden structures, 2,657 stone buildings, 122 churches, and numerous priceless documents and cultural objects. Thousands of people died, including 2,000 wounded Russian POWs who were being nursed back to health by the French after the Battle at Borodino. 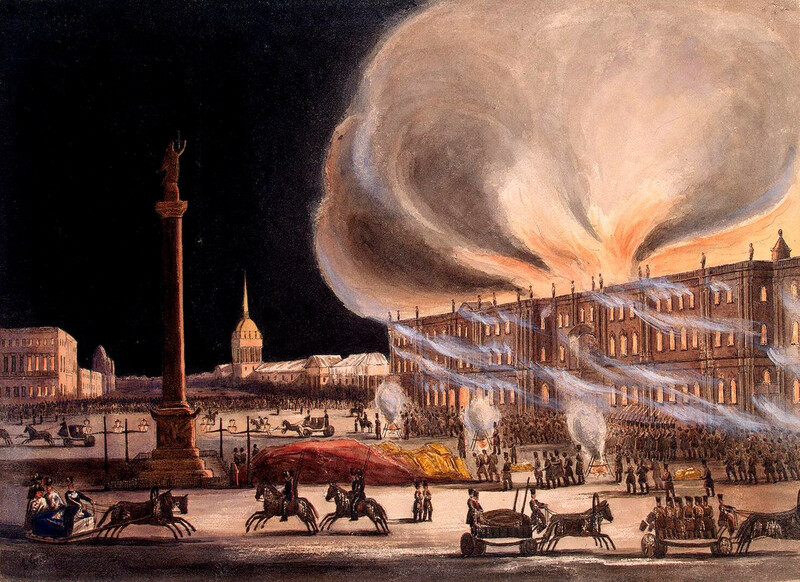 On Dec. 29, 1837, the Winter Palace – a luxurious St.Petersburg residence frequented by Russian emperors – caught fire. For 30 hours, firefighters and the 20,000 soldiers who had been called in were helpless, the blaze was too fierce. The second and third floors of the palace were burnt to a crisp. Beautiful halls, ornate decorations, priceless art, and unique manuscripts were lost in the fire. It took two long years to repair the damage. Moscow’s Manege exhibition hall was built in 1817 next to the Kremlin’s walls and commemorates the five-year anniversary of Russia’s triumph over Napoleon. On 14 March, 2004, a fire ripped through the building and only the outer walls survived. Police established that it was an arson attack but the perpetrators were never caught. It’s believed that the crime was linked to the presidential election held on the same day. Standing at 540 meters tall, Moscow’s Ostankino Television Tower is the tallest structure in Europe, and one of the main landmarks of the Russian capital. 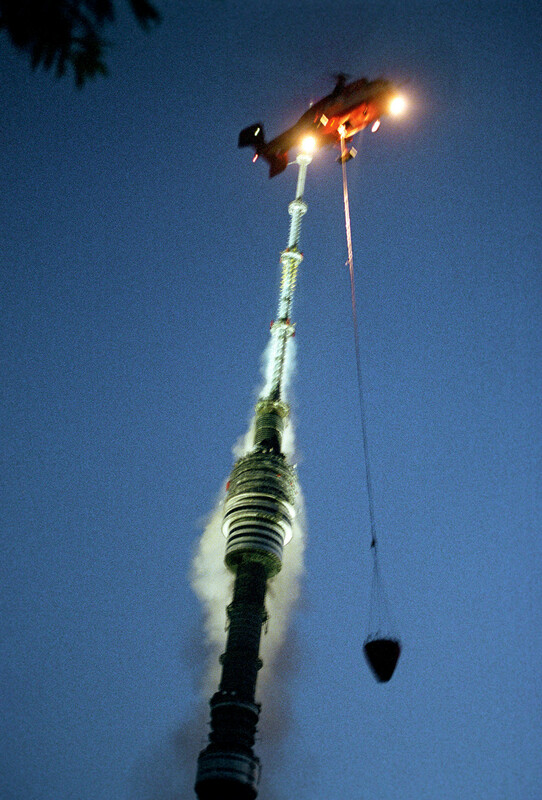 On Aug. 27, 2000, an intense blaze burned three floors of the lofty tower, including its famous restaurant called “Seventh Heaven,” which didn’t reopen until 16 years later. In fact, the fire was so intense that at one point it was feared that the entire tower might collapse. 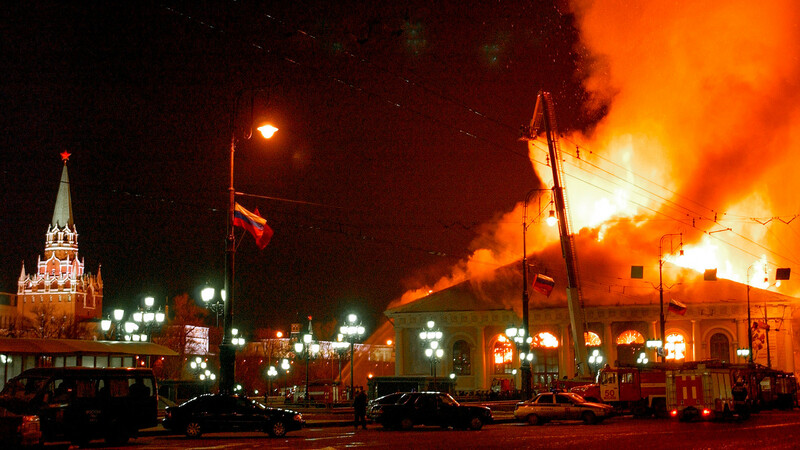 This remains the deadliest fire in Russia’s modern history. 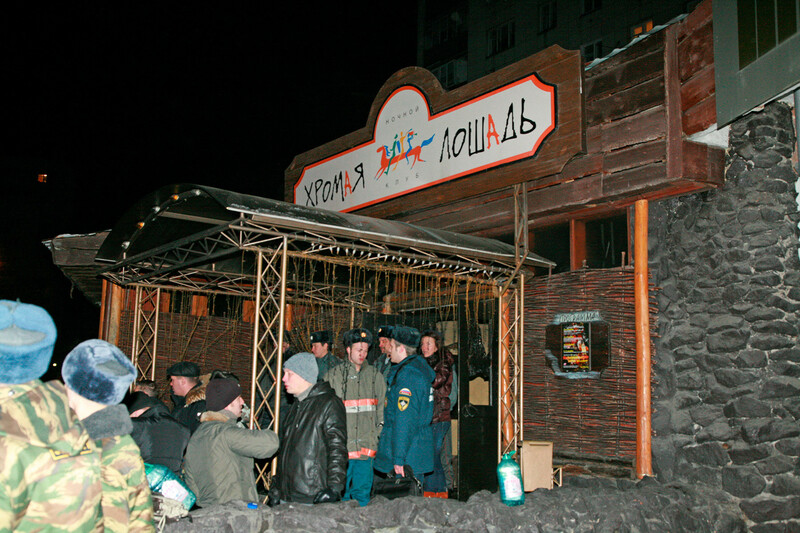 “The Lame Horse” nightclub in the city of Perm went up in flames on Dec. 9, 2009, after fire codes were ignored. The victims numbered 156, despite the fact the club was only big enough for 50 people – 300 people were allowed to enter that night. A firework ignited wooden decorations hanging on the walls, causing a human stampede as partygoers desperately tried to get out, but there was only one exit. Most of the victims died from smoke inhalation. The tragedy caused a big scandal in Russia: the club’s owners were arrested and the and the government of the Perm Region resigned. 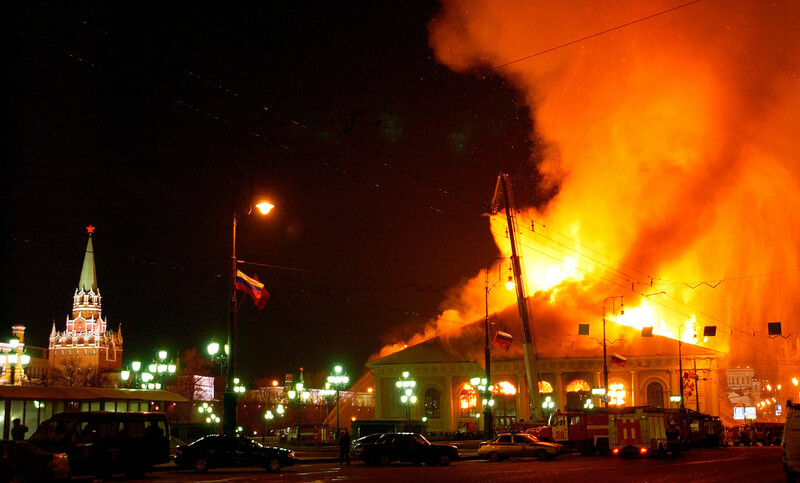 Who burned Moscow’s main exhibition hall?